Business users are becoming more comfortable with graph analytics. Check out the "Data Science, Machine Learning & AI" sessions at the Strata Data Conference in London, April 29-May 2, 2019. The rise of sensors and connected devices will lead to applications that draw from network/graph data management and analytics. As the number of devices surpasses the number of people — Cisco estimates 50 billion connected devices by 2020 — one can imagine applications that depend on data stored in graphs with many more nodes and edges than the ones currently maintained by social media companies. This means that researchers and companies will need to produce real-time tools and techniques that scale to much larger graphs (measured in terms of nodes & edges). I previously listed tools for tapping into graph data, and I continue to track improvements in accessibility, scalability, and performance. For example, at the just-concluded Spark Summit, it was apparent that GraphX remains a high-priority project within the Spark1 ecosystem. The widening number of applications means that business users are becoming more comfortable with graph analytics. In some domains network science dashboards are beginning to appear. More recently, analytic tools like GraphLab Create make it easier to unlock and build applications with graph2 data. Various applications that build upon graph search/traversal are becoming common, and users are beginning to be comfortable with notions like “centrality” and “community structure”. 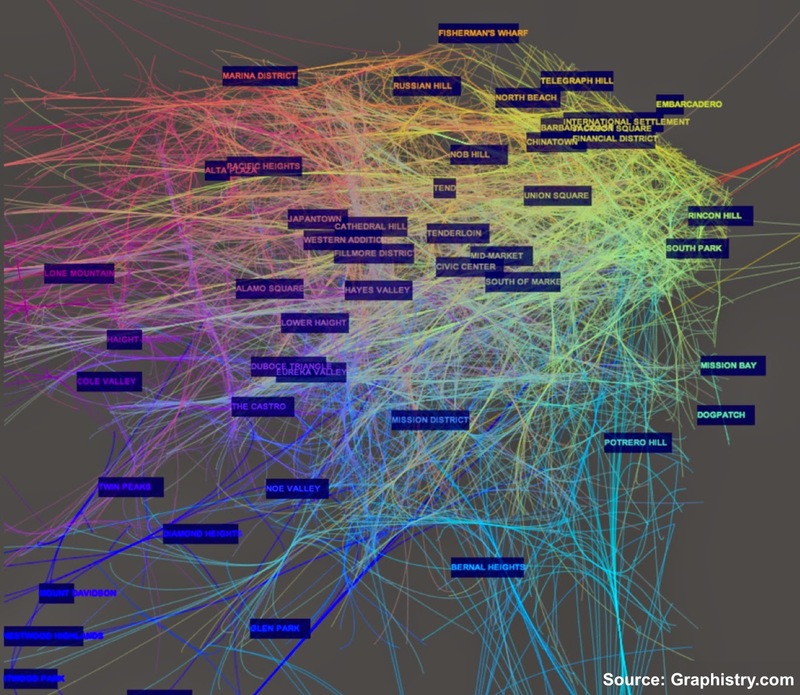 A quick way to immerse yourself in the graph analysis space is to attend the third GraphLab conference in San Francisco — a showcase of the best tools3 for graph data management, visualization, and analytics, as well as interesting use cases. For instance, MusicGraph will be on hand to give an overview of their massive graph database from the music industry, Ravel Law will demonstrate how they leverage graph tools and analytics to improve search for the legal profession, and Lumiata is assembling a database to help improve medical science using evidence-based tools powered by graph analytics. To learn more about managing and querying connected data, check out the second edition of Graph Databases. Article image: GraphLab graph. (source: GraphLab, used with permission).